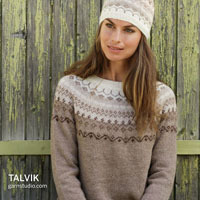 Go to original pattern for design DROPS Extra 0-1005. 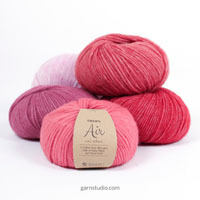 DROPS STRAIGHT NEEDLE SIZE 4.5 mm - or size needed to get 18 sts x 23 rows in stocking st with 3 strands = 10 x 10 cm. Inc 1 st on each side of the middle 2 sts by making 1 YO, on next row work the YOs twisted to avoid holes. Piece is worked back and forth on needle from mid back, beg at the top and work downwards. 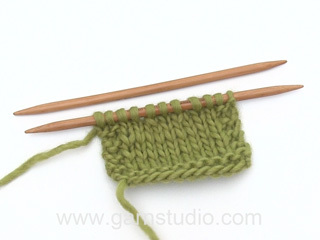 Cast on 50-54-58 sts on needle size 4.5 mm with 1 strand of each yarn (= 3 strands). Work 4 ridges in garter st over all sts. Work next row as follows: 1 edge st in garter st, * K 2 tog, 1 YO *, repeat from *-*, finish with 1 edge st in garter st. P 1 row. Continue in stocking st but work first and last st in garter st - AT THE SAME TIME on 1st row, inc 1 st on each side of the 2 middle sts – see INCREASE TIP! Repeat inc on every row (i.e. from both RS and WS) 15-17-20 times in total = 80-88-98 sts. Work 1 row after last inc. Now piece measures approx. 10-11-12 cm. Continue in garter st over all sts - at the same time after 3 ridges, dec 1 st at beg of the next 6 rows (i.e. 3 sts dec in each side) = 74-82-92 sts. When a total of 6 ridges have been worked, loosely cast off. Sew seam under foot and up along mid back - sew edge to edge in outer loops of edge sts to avoid a chunky seam. Cut 4 lengths of 1.5 metres each with off white. 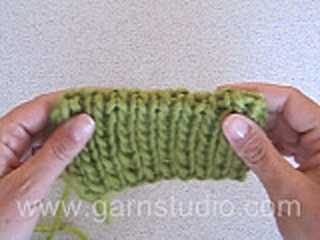 Twine the strands tog until they resist, fold the string double so that it twines again. Make a knot at each end. Baste tie up and down through row with eyelet holes - start mid front. 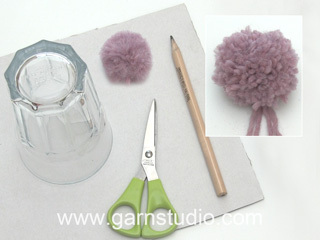 Make 2 pompoms with an approx. diameter of 2 cm in off white. 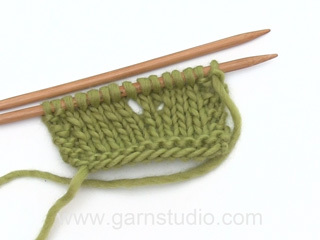 Fasten a pompom in each end of the tie. Repeat on the other slipper.